Mohammad Khatami accuses United States of stirring the latest unrest in the country. Iran’s former president Mohammad Khatami, who is viewed as a “reformist” and a “moderate”, on Tuesday condemned the violence that has rocked the country in recent days but also accused the United States of stirring unrest. 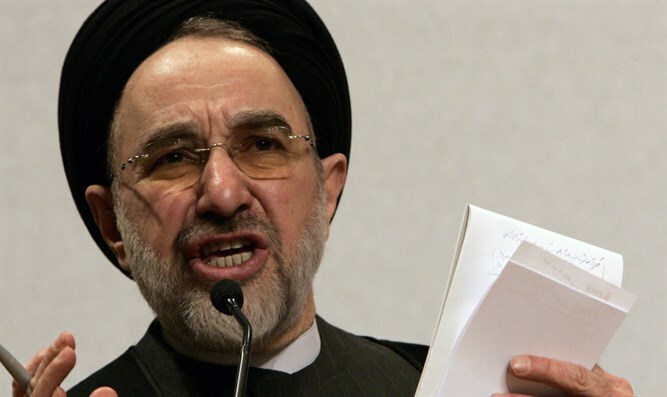 "Without doubt the Iranian people are confronted with difficulties in their daily lives... and have the right to peacefully demand and protest," said a statement from the Association of Combatant Clerics, which is headed by Khatami. "But the events of recent days have shown that opportunists and trouble-makers have exploited the demonstrations to create problems, insecurity and destroy public buildings, while insulting sacred religious and national values," said the statement, which was quoted by AFP. Khatami led Iran from 1997 to 2005 but was later barred from public appearances for his role in leading mass demonstrations in 2009. Tuesday’s statement from his group said the violence seen through five days of protests across the country would help Iran's "enemies". "The enemies of Iran, headed by the United States and their agents... have encouraged the trouble-makers and the violent actions," it said. Khatami supported Iranian President Hassan Rouhani in his re-election bid last May. The demonstrators that have taken to the streets in recent days have shouted “Death to the dictator” and “Death to Rouhani”, among other things.